Is your B2B marketing strategy stuck in the dark ages? When was the last time you revisited your personas? Chances are if you haven’t looked at personas in the past six months and revisited your targeting, you’re running the risk of losing out on an ever-changing demographic of savvy new buyers...Millennials. According to U.S. Bureau of Labor Statistics data, Millennials hold about 20% of all management jobs. This is a huge increase from 3% in 2005 and according to Chief Marketer, over the next 20 years, Millennials will have the most buying power. Sacunas points out that by 2025, Millennials will comprise 44% of the U.S. workforce. To take the point further, in a study, Google found that C-suite Executives aren’t driving many buying decisions and 81% of Millennials conducting purchase research have an impact on B2B purchases. They may be middle management or appointed as subject matter experts supporting a team purchase decision or they may be responsible for making the final purchase decision. If you do the basic math, you’ll quickly realize that Millennials are changing the way we do business and are constantly pushing the bar to innovate and evolve and cannot be ignored by Marketers. So you may understand the basic math but you’re a marketer, not a mathematician so what do you really need to know in order to keep selling to Millennial buyers? The first thing to understand is that Millennials make purchase decisions differently than Boomers and Gen X. According to an IBM Study, the most notable difference is that before making a recommendation to buy or making the decision to buy, 55% of Millennials solicit input and opinions from their peers. This feeds into their desire for consensus and collaboration and is one of the key differentiators between them and older generations. Millennials like to spend time doing their own research early on in the buying process but are open to high touches from vendors later in the sales process. Moving forward, the challenge for B2B marketers will be to align your demand generation approach with the expectations of Millennials. Here are seven ways to get started. Many B2C brands have found success humanizing their brand by making it resonate with social causes and philanthropy but most B2B companies haven’t mastered this approach. Take the time to get to know each of the segments within your Millennial target market and get involved in causes that matter to them and that are aligned with your company mission. Some other ways to humanize your brand include using personalized automated emails, signing your emails with your signature, engaging with people on social media and skipping the stock photos and using actual photos of your team on your website. The Millennial Generation is so large, that within this generation you will find different behaviors, attitudes and tastes. While this subsetting may sound challenging for B2B Marketers, targeting is not that difficult because Millennials generally readily share information about themselves. Marketers do need to keep in mind that when building a B2B strategy targeting Millennials, the buying cycle and expectations will continue to evolve with future Millennials with purchase power as IBM shows in this graph. While price is certainly a factor when making a B2B buying decision, Millennials are attracted to vendors that are willing to take a collaborative partnership position and that are committed to providing a great client experience. Make it easy to do business by interacting with them when and how they want to - which usually means via social media and instant message. Once they see the value in your expertise, they will be eager to collaborate as long as you provide the data, speed and collaboration they desire during the buying process. IBM’s graph below, “To Buy or Not to Buy? 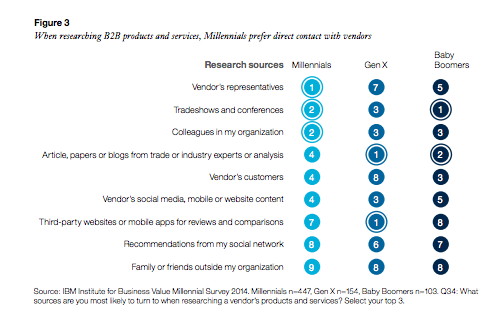 How Millennials are Reshaping B2B Marketing” gives you insight into how Millennials prefer to collaborate with vendors during the research phase of their buying journey compared to Gen X and Baby Boomers. Number 1 indicates the most favorable choice from each generation and number 9 indicates the least favorable choice for each generation. For Millennials, Vendor Representatives are their number 1 choice of contact during research, further solidifying the need for a collaborative partnership. More than 50% of Millennials rely on analytics to help them make better decisions. They will conduct their research with search engines, vendor sites and social media at the early buying stage. Make sure you provide easy-to-access and relevant information through content that is authentic and contextual. Speak their language on their terms. 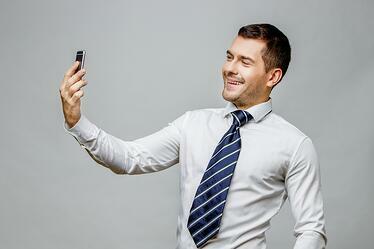 Millennials in middle management prefer to engage face-to-face or over the phone. Be mindful of future trends that show Millennials in the 21-25 range with 41% using facebook to connect with vendors and 41% preferring to use instant messaging. As these younger Millennials progress into decision-making roles, vendors will be expected to interact with clients and prospect through mobile devices and apps. During the decision stage engage their way with short and simple communications. Give Millennials piece of mind that they are making the best decision. But don’t push with a sales pitch. Have a conversation and help them find solutions to their business challenges. Give them an idea of what it will be like to work with you and your company. Make your message simple and personalized but be ready to offer more context to differentiate your message as needed to appeal to Millennials’ Gen X and Baby Boomer co-workers that they will be seeking consensus from. Since almost all steps of the purchase cycle will leverage technology, make sure you have a clean, easy-to-navigate website that works on all devices. 36% of Millennials will solicit feedback from their families and friends when making B2B buying decisions so what can B2B Marketers do to influence the influencers outside of their target market? One place to start is taking into consideration your brand’s reputation outside of your main market. Collect and analyze data to gain more insight into your client’s ecosystems so you can create new marketing strategies that will reach a broader audience. To avoid data overwhelm, focus on developing personas that give a full view into your client’s most likely influencers. You can leverage social listening tools to determine if these influencers are getting enough exposure to your brand. If you are lacking in the exposure department, explore digital tactics that include value propositions with personalized messages for key influences. Spend some time developing a strong voice that will position your brand well in influencer communities. Millennials are fully aware of the impact of online reviews and are sensitive to the negative impact they can have on companies. Because of this awareness, when it comes to B2B purchases, if they are unhappy they will most likely not say anything. Silence should make you nervous because Millennials have been found to be eager to share a good experience. As a marketer, you understand the power of word-of-mouth and your job is to turn your Millennial customers into evangelists. Take advantage of the 69% of Millennials that are willing to post positive comments on social media when they are happy clients. Make it easy for your Millennial customers to share their success stories on their favorite channels. 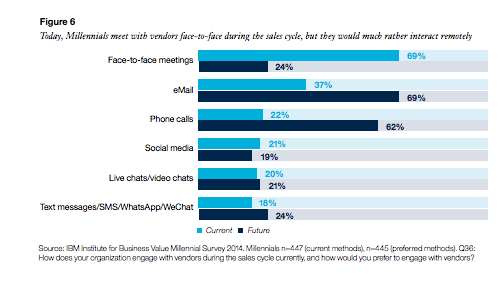 There is no doubt that Millennials are and will continue to impact B2B marketing and sales. Take the time to figure out how they will impact your business so you don’t get left behind.